Tony Martin, on his own, can almost beat the entire peloton over a distance of 175km. When he decided to have a go with 3.3km to go on stage four, the front group didn’t stand a chance. They’d maybe have stood half a chance if they’d chased him down instantly, but Geraint Thomas was on the front at the time and Team Sky weren’t too bothered about losing either the stage or the yellow jersey. It took a few moments for the other teams to get organised and Tony Martin covers an awful lot of tarmac in just a single moment, let alone several. The German needed to gain one second to get ahead of Chris Froome. He got this easily and then he got a time bonus as well. Having finished second in the opening time trial, Martin could have taken the yellow jersey on stage two if Mark Cavendish had finished third ahead of Fabian Cancellara – the time bonus for the Swiss is what edged him out. He was then just one second away from taking it on stage three. So close, but yet so far. It seemed like it would never happen for him and this is precisely why he was all the more delighted today. There’s some sort of philosophical life lesson in there for all of us. But this is no time for reflection. This is a time for three fun facts about Tony Martin. 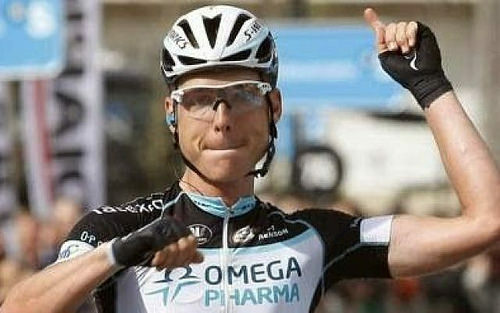 How many watts did Tony Martin produce? If Tony Martin says that, it must have been at least a zillion. The other great highlight of the stage was Thibaut Pinot flouncing around like the world’s Frenchest man. The battery in his electronic derailleur went and he wasn’t happy about it. A team-mate stopped to lend him a bike, but Pinot said something like: “No, I don’t want his bike. I want my own bike,” and so opted to wait around for the support car, wasting even more time; time he spent bouncing his bike up and down as if he wanted to smash it but didn’t quite dare. It was gloriously childish. The upshot of all of this was that Pinot lost touch with the front of the race and finished in a large group 3m23s after Martin. Third last year, his overall hopes in 2015 are looking a bit shabby, having lost a minute and a half in the crosswinds on stage two and then the same again on the Mur de Huy. You imagine Degenkolb’s bike bounced off the frame having first travelled some distance. Either way, suspension or not, bikes shouldn’t really bounce. It should – should – be a fairly straightforward sprint day. This is good as it’s also the first day of the Ashes. Feel free to follow that sporting event with me too – or at least you can until I crumple under the weight of my various self-imposed sport-following commitments.